Microsoft Excel is a high-utility spreadsheet for use on calculation and macro programming. Excel also boasts compatibility with Visual Basic for Applications. Data is arranged and evaluated in a grid of cells, where it can be formulated or displayed in charts. Not only the name is different but also some minor parts of the syntax! For example in the German version ; is used instead of , to separate the parameters. In cells D1 - D3 are the values 2,3 and 6 In cell D4 is the following Formula: =SUM(D1:D3) , The Result is 11 which shows in the cell. Sum Adds all numbers in a range of cells. In cell F2 is the Formula: =count(E1:E10) , the Result is 8 which shows in the cell. In cell F3 is the Formula: =counta(E1:E10) , the Result is 8 which shows in the cell. In cell F4 is the Formula: =countif(E1:E10,">5") , the Result is 5 which shows in the cell. In cell F5 is the Formula: =countblank(E1:E10) , the Result is 2 which shows in the cell. Count() Counts the number of cells in a range that contain numbers. Counta() Counts the number of cells in a range that are not empty. CountIF() Counts the number of cells in a range that meet a given condition. 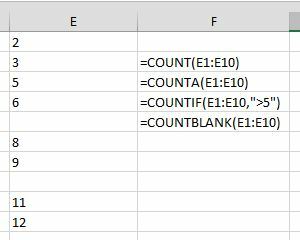 CountBlank() Counts the number of empty cells in a specified range of cells. There are also many string Formulas. In cell D1 is "Hello World!". In cell E1 is the Formula: =left(D1,5) , the Result is: "Hello"
In cell F1 is the Formula: =right(D1,6) , the Result is: "World!" In cell G1 is the Formula: =mid(D1,7,5) , the Result is: "World"
These three Formulas count the characters of the string starting with position 1 being the first character.